Interested in Transferring to the College of Engineering? If you are entering as a freshman and have AP, IB or dual enrollment credits with appropriate grades, those credits will be applied toward your degree requirements within the College of Engineering. An examination report or official college transcript is required before the credit is transferred. We strongly encourage you to take the final examinations in AP or IB courses because credit cannot be granted without an examination result. View specific AP and IB equivalencies now. If you are planning to transfer, your transfer credits will be evaluated during the application process. Transfer credit will only be accepted from colleges that are accredited by one of the seven regional accreditation bodies in the U.S., or on a case-by-case basis for institutions outside the U.S. It may be necessary for students to provide course descriptions to gain transfer credit. It is possible for students to “challenge” courses with permission of the faculty and must be done within university guidelines. Results from CLEP, AP or IB exams must be submitted for credit to be considered. Students who transfer from a college in the Virginia Community Colleges System or Richard Bland College should be aware that transfer course equivalencies have been determined through an agreement between VCU and VCCS. 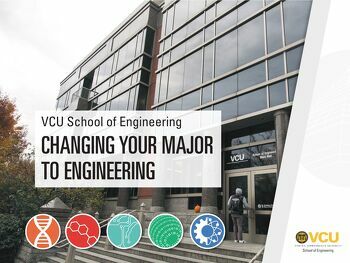 Students are encouraged to contact the College of Engineering about transfer equivalencies of specific courses toward requirements in the engineering and computer science curricula. View the transfer guide now. Transfers with fewer than 30 college credits must submit a high school transcript and SAT or ACT scores (if under the age of 22) to complete their application for admission. Veterans of the U.S. Armed Forces who have military education credits should forward copies of documentation with their application for admission so that possible transfer credits can be identified.